This Employee Benefit Handbook helps you run your business. It covers both company's policies and benefits. Once you give one to an employee and then archive the signed employee acknowledgment form, there can be no dispute over whether you explained your company's policies. It&apos;s all there in writing, and everyone reviewed the same information. You also acquire a measure of legal protection if an employee in a court or administrative proceeding challenges you. An Employee Benefit Handbook can be an objective piece of evidence showing that you&apos;ve adopted fair and uniform policies. With it, you inform your employees' company's expectations during their employment. 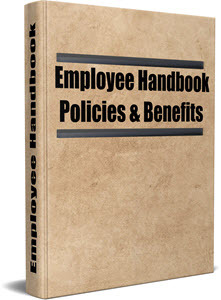 The Employee Benefit Handbook serves as a valuable tool for communicating, on an official basis, information regarding company policies and benefits. This Employee Benefit Handbook contains all the most important company policy issues. You can easily customize it in almost any word-processing software. Edit it as you wish. Insert your company logo and company name, but you may not need to do much else. If there is a topic you don't desire, just simply delete it. Until now, creating an Employee Handbook was extremely time-consuming and very costly. This handbook lets your company avoid this time-consuming and expensive hassle. Most of all, you don't need to wait. You can instantly download it after purchase. Then print and publish in no time at all. Any type of manufacturing / hourly setting. In addition to the policies contained within the above two pre-formatted Employee Handbooks, the package includes 22 additional policies. These extra policies ensure that you have a full array of topics and levels of sophistication to choose from... with a little cutting and pasting you&apos;ll soon have your custom handbook tailored and published. Safety & Safety Attire Policy.